Around 40 health and care professionals from across Yorkshire took part in an event focused on improving the physical health of people with a serious mental illness (SMI). People with SMI are at risk of dying prematurely, in some cases 20 years earlier than the general population. Many of these deaths are preventable if conditions like high blood pressure, diabetes and cardiovascular problems are identified and treated early. The Yorkshire & Humber AHSN is leading the spread and adoption of the use of the Mental Health Physical Health Review template in primary care to help address this issue. The template is a short, electronic physical health assessment form that guides healthcare professionals in primary care in carrying out annual health checks for patients with SMI. It is freely available on EMIS and SystmOne primary care systems. 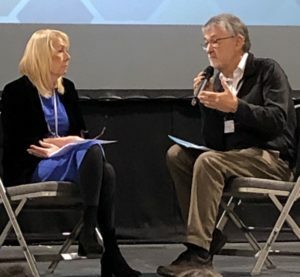 The Improving the Physical Health of People with SMI event, at Unity Hall Wakefield, was organised by the Yorkshire & Humber Academic Health Science Network (AHSN). Yorkshire & Humber AHSN has also funded an e-learning module on use of the template for healthcare professionals in primary care. Demonstrate that this is an effective tool for primary care and supports organisations to achieve NHS England’s national targets around the number of physical health checks performed on patients with SMI. Understand what support the region’s Integrated Care Systems (ICS) and Sustainability and Transformation Partnerships (STPs) want from the Yorkshire & Humber AHSN to deliver their targets. Delegates were welcomed to the event by Ruth Wilson, Programme Lead at the Yorkshire & Humber AHSN, before she introduced the speakers – Kate Dale and Dr David Shiers. Kate was the driving force behind the Mental Health Physical Health check template originally designed, piloted and implemented by a team from Bradford District Care NHS Foundation Trust (BDCFT) in collaboration with the area’s primary care organisations. Kate, supported by the Yorkshire & Humber AHSN, is now working to roll it out across the country. Dr David Shiers, a retired GP, cares for his daughter who has schizophrenia. He told a compelling story about his experience as a carer and the challenges he and his family have faced. He went on to give his professional opinion on why it is important to provide holistic care for people with a serious mental illness to reduce the number of patients dying prematurely from preventable conditions. Following Kate and David’s presentations, delegates were invited to get together in groups to draw up action plans around increasing the number of physical health checks for people with SMI in their Clinical Commissioning Group’s area.